This Sunday, Nov 2, some volunteers from East Mill Stone Syro Malabar church will be here to ask our support for their church construction. It is with deep sorrow that I inform you that Sonia, daughter of Sebastian Thalappillil (brother of Abraham Thalappillil) passed away early this morning after a long and painful battle with cancer. She was just 23 years old. Our hearts go out to the family and we share their pain. May God comfort and strengthen her parents, brother and the extended family. Wake service will be held tonight in Long Island and Sonia will be laid to rest tomorrow, Sat, Oct 18. May Sonia rest in peace and let perpetual light shine upon her! With deep sympathy and hope in Jesus' promises! Please take a look at the very important aspect of our Faith Life and register as families or individuals fort he Community Caring for Life Conference. PS: Scroll down to see the brochure. Thank you for your time. It was nice talking to you. Thank you for your support and words of encouragement in spreading awareness of Life in your parish. We appreciate your passion in encouraging others about this great ministry which has made it possible to reach out to many. 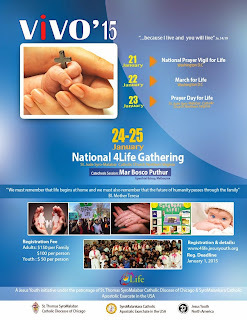 We would like to inform you with immense joy that His Excellency Mar Bosco Puthur, Bishop of Australia and New-Zealand will be joining us for National 4life gathering VIVO'15. 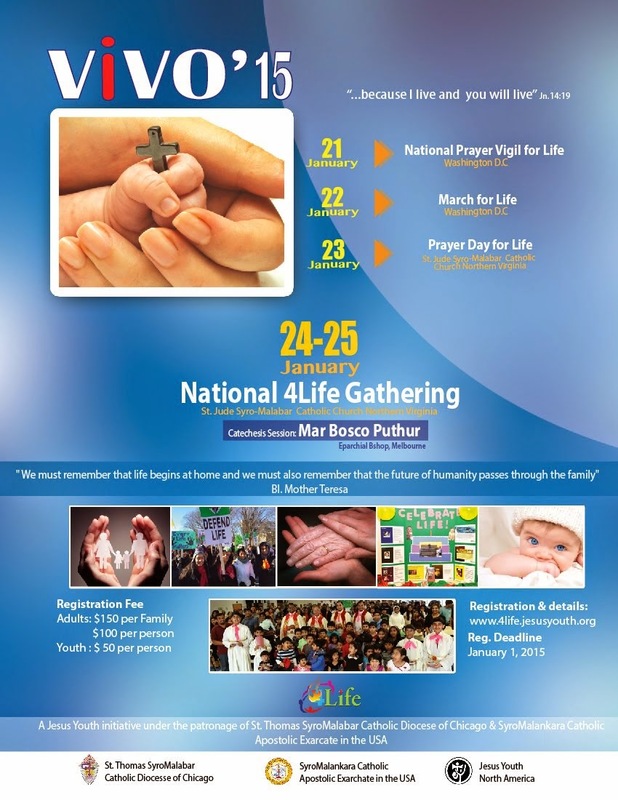 It would be our honor to welcome you along with families from your parish for VIVO'15 to St. Jude Syro-Malabar Catholic Church of Northern Virginia on January 24th - 25th, 2015. Your leadership, presence and support will be an indispensable part of the conference. The last day for registration is December 31st, 2014. Please find the attached flyer and brochure for more details which can be used for email or in person distribution. Here I am forwarding for reading purpose the attachments that include our Bishop Angadiath's Pastoral Letters for the month of October. Greetings from the chancery office. Kindly see the attached Pastoral Letter and Circular by His Excellency Mar Jacob Angadiath. as we have on all other weekdays of the 10 day celebration. All days except Sunday, there will be one or two priests to hear confessions before Mass for 30 minutes. May Mother Mary bless all of us! Today at 5.20 pm our dear Josachan underwent kidney transplant surgery at Montefiore Hospital in the Bronx. The surgery lasted 4 hours and now he is moved to the Post Anesthetic Care Unit. As Josachan was on the beneficiary list, yesterday he got confirmation about the availability of a matching kidney. We offered special prayers for Achan at this evening's Mass and Rosary. Also, this morning I got an opportunity to pray with Achan over the phone and to assure him of our continued prayers and support. Please say a special prayer for Achan tonight or tomorrow as you get a chance to read this message. He has touched all our lives in one way or another. May the good Lord grant him a quick recovery with all best post-operative results! Our Rosary devotion is starting on tomorrow(10/09/2014) and ending on (10/18/2018).Please try to attend the Mass and Rosary on these days. We have the sponsors for the Rosary devotion on all days except 10/09/2014,10/10/2014 & 10/16/2014. The sponsorship for the Rosary is $200.Rosary mass is devoted to the sponsor's intentions. If any of us want to sponsor on the above dates, Please reply to this email. As you all know today is First Friday and we have night vigil adoration after 5.30 pm Holy Mass and Novena. In the special circumstance of the need to have a talk by Rev Dr. Jimmy Poochakkattu for our CCD Parents about Family Catechism and Christian Parenting, I thought we should have a time table. 9.00 to 10.00 pm: Adoration of the blessed Sacrament. Please make use of this great opportunity. All are welcome to attend the whole night. The whole program will happen in the Church. This is a reminder for all parishners that the Night Vigil of this month is tomorrow Oct. the 3rd from 5:30PM to 10:00PM. Rev. Fr.Jimmy Poochakatt will say the Mass and will give us a special talk about family catechism and parenting and will lead the Eucharistic Adoration. We the spiritual life team invite you all to come, worship togother. St.Jude's feast. If any of us want to become presenties , please reply to this email or sign up in the social hall. NB:We have CCD on October 26th, but not in November 9th. It is with deep sadness that I inform you of the demise of Chinnamma Cyriac mother of Annie Bino Mulackal. Bino is the son of Mathew Abraham Mulackal a great friend and supporter of our church. Chinnamma passed away on Tuesday, Sept 30 and will be buried in India in Memury, Kurupanthara, Kerala. On behalf of our parish, I will be offering a prayer service at their residence and offer our sympathies to the family tonight (Tuesday, Oct 1) at 7.30 pm. I invite you to join me at 72 Woodbine Rd, New City. You can take Woodbine Court from New Hempstead Road. There will be a viewing at 5 pm and Mass at 6 pm tomorrow, Thu, Oct 2 at St Augustine's Church in New City; which I will not be able attend.